The main aim of this proposed project is to design and implement a flexible, cost-effective and powerful GSM Based Industrial Automation security system. A GSM based Industrial Automation system is needed for the occupant’s convenience and safety. This system helps you to detect burglary, leaking of harmful gas, smoke caused due to fire and after detecting suspicious activity, it sends an alarm message to the owner number as well as security personnel. 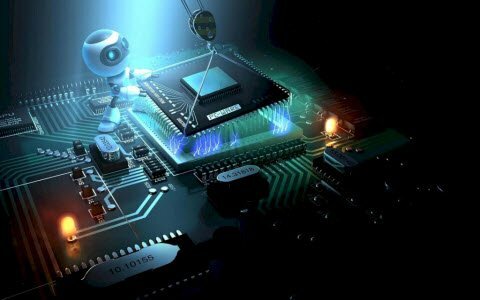 The concerned person will take some action, by sending some commands to the Microcontroller unit through registered mobile and controls the industrial devices through Relays. Industrial automation or numerical control is the use of control systems such as computers to control industrial machinery and processes, reducing the need for manpower. The operation and control of the modern industrial equipment and process needs lots of sensors to monitor several parameters of the systems. The proposed system comprises of GSM modem, Microcontroller, various sensors, relays, memory and LCD Display. If the user wants to control the system from a remote place, he/ she has to send the SMS command from his registered mobile indicating the operation of the device. The GSM modem embedded with Microcontroller receives the user’s command. According to the received message, the Microcontroller will switch ON/ OFF the relays (i.e. specific application). The block diagram of the GSM Based Industrial Automation system has shown in the below diagram. The system mainly consists of three components the GSM MODEM and the interface circuit that includes the different sensors used. The interface circuit diagram and main power supply connections are given in the below diagram. The GSM connected to the user, police station, and fire brigade through the mobile cellular network. The function of the GSM MODEM is the remote communication between the user (through mobile) and the controller through the RS232 serial communication standard. The Microcontroller is continuously checking the outputs of the different sensor and send messages through the GSM network in case of emergency. The Microcontroller is connected to various devices like a smoke detector, motion detector, IR sensor, LDR through relays. 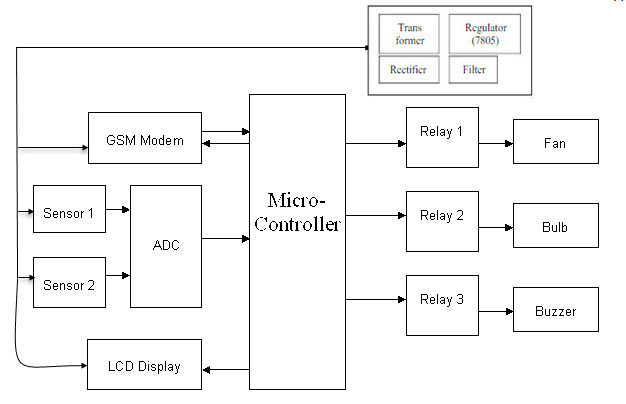 An interface circuit has been designed which includes the programmed Microcontroller and the GSM modem through the serial port of the GSM MODEM, the sensors as input devices and those are connected to Microcontroller and relays. 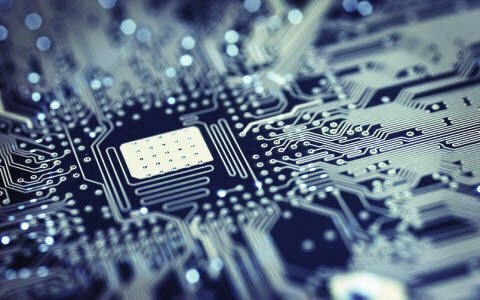 The main role of each hardware component is explained in detail below. The power supply unit provides two DC voltages (5V &12V) for different usages. The below diagram shows a simple circuit to get a 5v and 12v power supply from a single circuit. 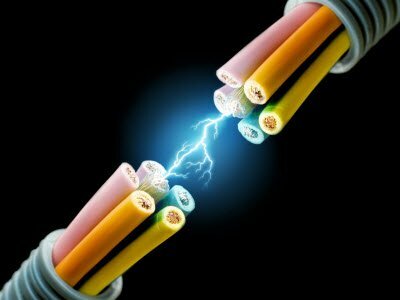 The AC mains will step down by a step-down transformer T1, rectified by bridge rectifier B1, and filtered by smoothing capacitor C1 to obtain a steady DC voltage level. 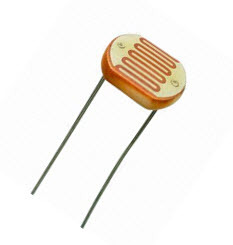 The IC 7805 voltage regulator used to obtain 5V DC. The IC 7812 voltage regulator used to obtain 12V DC. The AT89S52 is a low power, high-performance CMOS 8-Bit Microcontroller with 8K bytes of flash memory (in system programmable memory) it is manufactured by Atmel with high-density nonvolatile memory technology and is compatible with industry standard 80c51 instruction set and pinout. In this system, the Microcontroller programmed in such a way that, it always searches for input from the sensors. If the Microcontroller interrupted by the signal from any of the sensor then it will give commands through the GSM MODAM to the user mobile by sending an SMS. 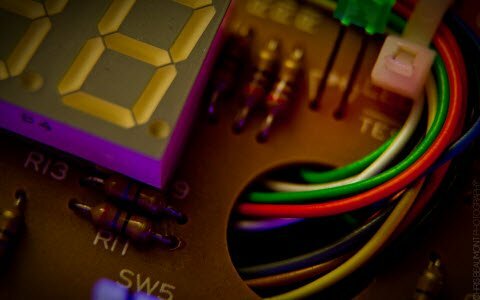 The LCD is connected to the microcontroller to display the status of MODEM, status of the sensor. For example, if the microcontroller is initializing the MODEM, if any case, MODEM failed to initialize, the user doesn’t know what is happening in the system, so we are using the LCD to display the status. We used GSM/GPRS SIM900A modem works on frequencies 900/ 1800 MHz. 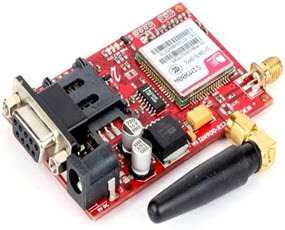 The modem is coming with the RS232 interface, which allows you connect to a PC as well as a microcontroller with the RS232 chip (MAX232). The baud rate is configured from 9600-115200 through AT command. It has an onboard Regulated Power supply. Using this MODEM, we can make audio calls, SMS, Read SMS, attend the incoming calls and internet etc through simple AT command. Nowadays everything is going to be automated using smart MODEM technology, using this technology we can access any devices remotely. 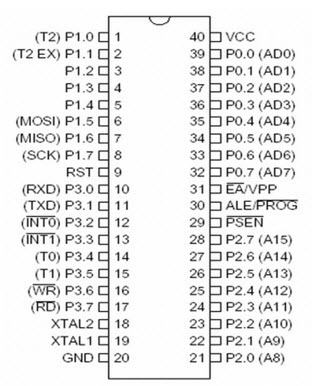 The GSM MODEM is communicating with the Microcontroller using AT commands, for example, if we want to send an SMS to Aa number 98xxxxxxxx, the commands we have to send is AT+CMGS=”<98xxxxxxxxxx>”, <enter>, <message>, <ctrl+Z>. In this project, it is used to send SMS to the owners mobile when something unwanted things happened in their home or industry without permission. The RS-232 is a communication cable, commonly used for transferring and receiving the serial data between two devices. 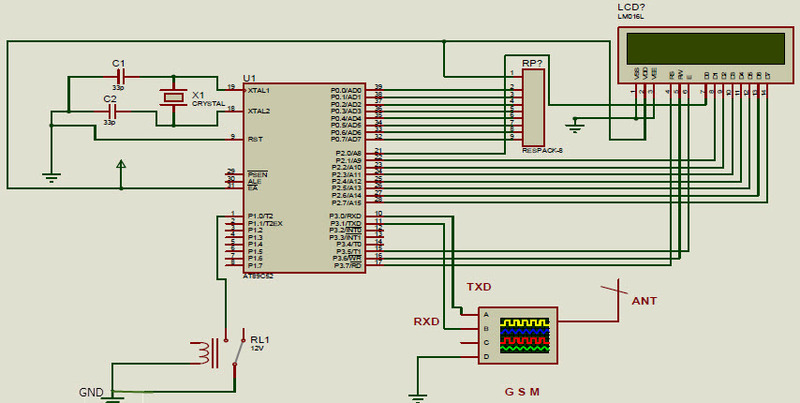 In this project, it provides communication between MODEM and the microcontroller. A Smoke Detector device is a smoke sensing device that indicates the fire. Smoke Detectors are very useful in homes, offices, schools and industries. The MQ-2 sensor detects the presence of combustible gas and smoke at concentrations from 300 to 10000ppm. This can be easily connected to the microcontroller. Whenever the smoke the detects any smoke/ fire, then it sends signals to the microcontroller then MC will send SMS to the user mobile. An LDR is a device that has a variable resistance that changes with the light intensity that falls upon it. 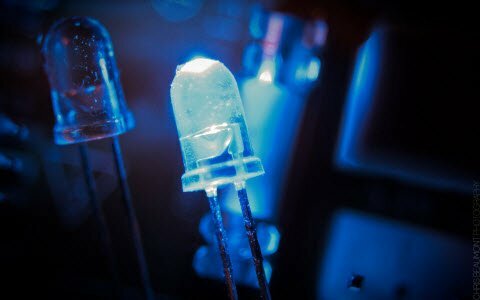 This feature allows them to be used in light sensing applications. 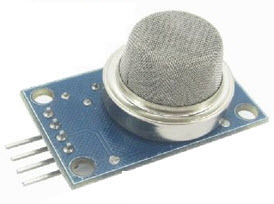 In this project, we can use this sensor for lights on/off purpose. 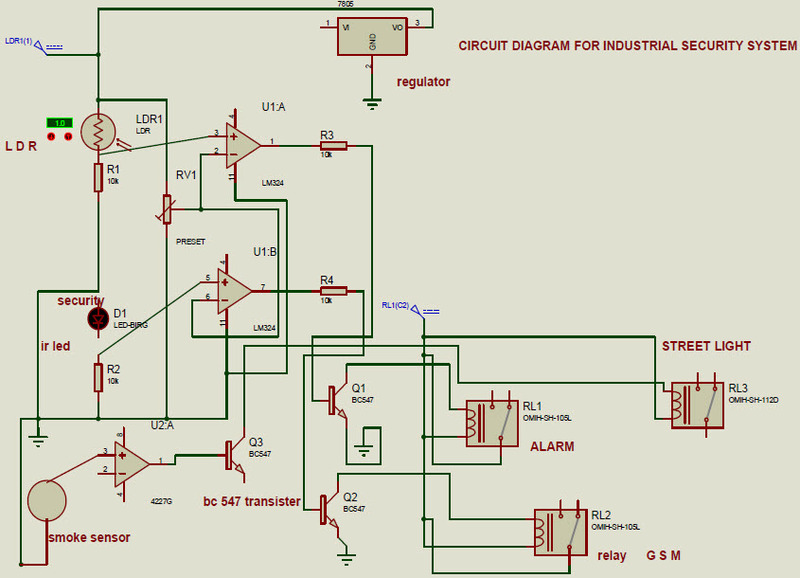 Thus, this is all about implementation of GSM Based Industrial Automation. We hope that you have got a better understanding of this concept. 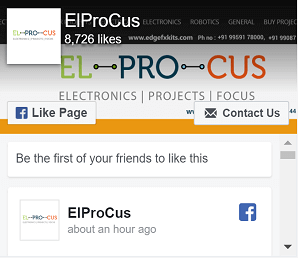 Furthermore, any queries regarding this concept or electrical and electronic projects, please give your feedback in the comment section below. Here is a question for you, what role of RS232 in this project? Why we are connecting relays at the output?? The relay is an electrically operated switch, used to control different loads. I sincerely appreciate your kind response regarding my article. Please contact our executive Mr. Sathish. आपके पास CSE के मिनी प्रोजेक्ट्स क्लाउड कंप्यूटिंग पे कौन-कौन से हैं? we are very sorry, we develop electronics and electrical based projects. how may I help you? please provide your query in English.